Posted Friday, May 11th, 2012 by Robyn Warner. Standard printers are a necessity in most offices regardless of the nature of the business. However, there are a few specific situations that require a thermal printer, which is typically small enough to be carried in one hand. Some examples of work environments that use thermal printers on a daily basis are gas station pumps, tickets kiosks, lottery machines, any establishment with cash registers or credit card machines and warehouses that print shipping labels. These machines are not the same as thermal inkjet printers. If you have a thermal label printer and you purchase inkjet cartridges for it, there will be nowhere to install them. 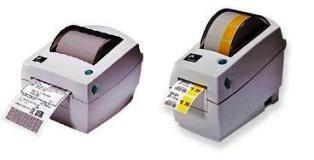 There are four essential components of these devices, all of which must be properly functioning to produce sufficient labels or receipts. The controller board is basically a built-in computing system that controls the overall functionality of a thermal printer. Most printers have a controller board. The platen is a roller system made of rubber that feeds the paper through the unit. The thermo-sensitive paper will typically be on a roll, as to avoid a need for a paper tray. The thermal head is the component that generates heat and actually prints on the paper, but it is the spring that puts pressure on the head, forcing the contact between head and paper. When an image is sent to the thermal printer, the head selectively heats specific areas of the paper when it passes through, which then blackens. There are dual-color thermal printers that can produce black and another color, which is almost always red. This is done by applying two different temperatures of heat. So, what work conditions typically require thermal printers? Grocery stores, transportation and health care are a few. In a grocery store, or really any store where purchases are made, thermal printers are used to print the receipts. When it comes to various forms of transportation, such as airplanes and trains, thermal printers are used to generate boarding passes and if refreshments are sold on board, the receipts will also be printed with thermal technology. It is the health care industry that probably uses thermal printing the most though. From prescriptions to ultrasounds, this type of printing is known for its clarity, which is essential in the medical field. In hospitals especially, where messes are made daily, documents printed with a thermal printer will be far more durable than standard prints.